On International Women’s Day 2017, I posted the first Wonderful Western District Women post followed by a second later in March, Women’s History Month. Today is International Women’s Day 2018 so it’s time for another edition. Each post looks further into the lives of Western District women I’ve come across while writing the Passing of the Pioneers posts. This time there are three women featured, Eliza Malseed, Edith Davey and Mary Learmonth. 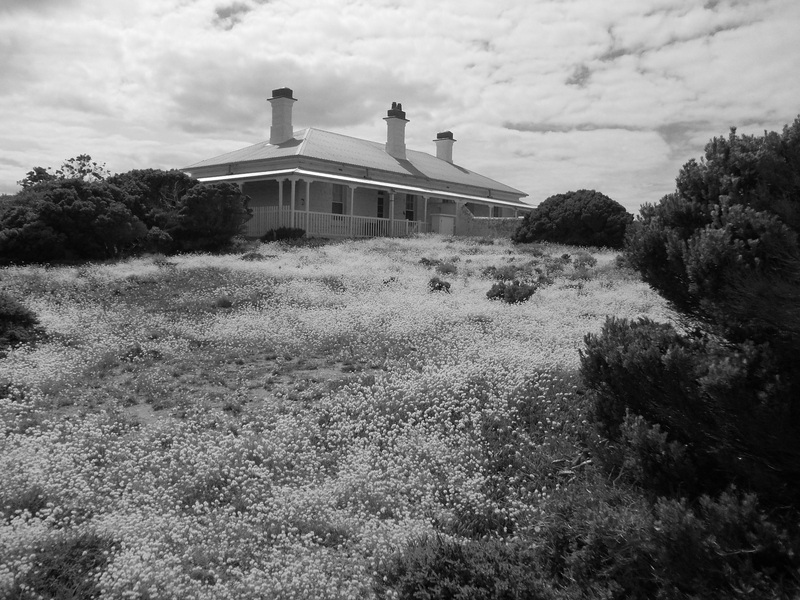 Eliza lived in an isolated area of Victoria’s far south-west coast while Edith lived in another isolated area, further east on the coast near the Twelve Apostles. Both endured the hardships of living in such places and displayed independence enabling them to endure. Mary Learmonth’s life was more comfortable, but not only was she a great sportswoman she was a champion of causes, a dedicated worker for those less fortunate than herself. Remember to click on any of the underlined text for further information. Eliza Ann Malseed was born in Donegal, Ireland around 1836 to James Malseed and Ann Thompson. In 1855, Eliza and her brother James and her cousin, also James Malseed arrived at Portland aboard the Blanche Moore. An older brother John had arrived in Portland in 1849. Eliza lived in Gawler Street until she married her cousin James around 1859 and they settled at Glenorchy at the foot of Mount Richmond an extinct volcano in an isolated about twenty kilometres to the west of Portland. Their first child was born in 1860. Eliza had a further nine children. It was a harsh life and Eliza and her young children were often left alone while James was away in Portland. She had many travellers pass her door looking for food on their way to Mount Gambier giving her many tales to recount. When remembering those days she would say,”The Lord was my shepherd”. 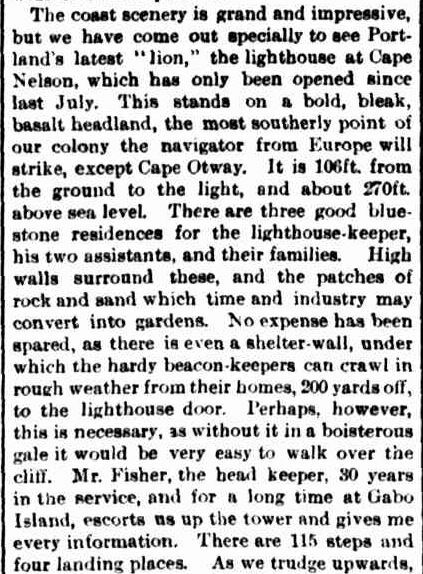 Bushfires were frequent and the family were lucky not to lose their home in 1864. There were other dangers too. At different times in December 1878, James and one his daughters received snake bites. On each occasion, James cut out the flesh around the wound and sucked the venom out. Both somehow survived. 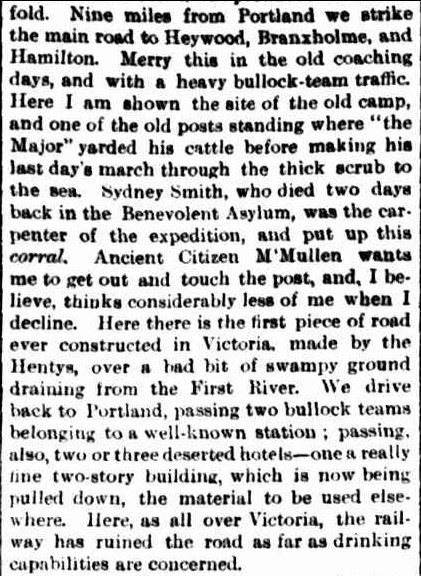 James wrote a letter to the Portland Guardian to tell the story, published on 7 January 1879. Eliza was a Wesleyan Methodist and attended the Mount Richmond Methodist Church which opened in 1876 and she was very active within the church community. In 1902, James fell ill and on his doctor’s advice, he moved to Portland closer to medical care. James died there on 26 July 1902. Several years later, Eliza went to live at Rose Villa, Myamyn, the home of her daughter. 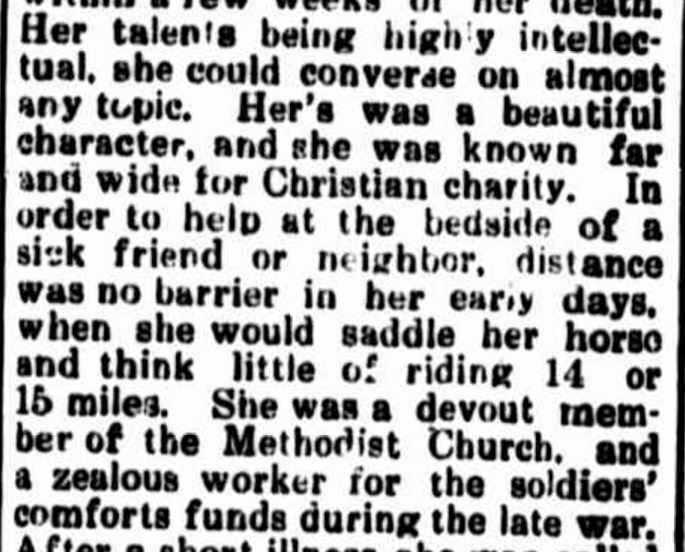 Eliza died there on 11 August 1920 aged eighty-four and was remembered in her obituary below. “Obituary.” Portland Guardian (Vic. : 1876 – 1953) 26 August 1920: 3 (EVENING.). Web. 6 Mar 2017. Edith Davey was born at Port Fairy in 1861 a daughter of Robert Davey and Ann Phillips. Edith had a sister, Annie five years older than herself. Another sister Emily was born in 1858 but she died a year after Edith’s birth. 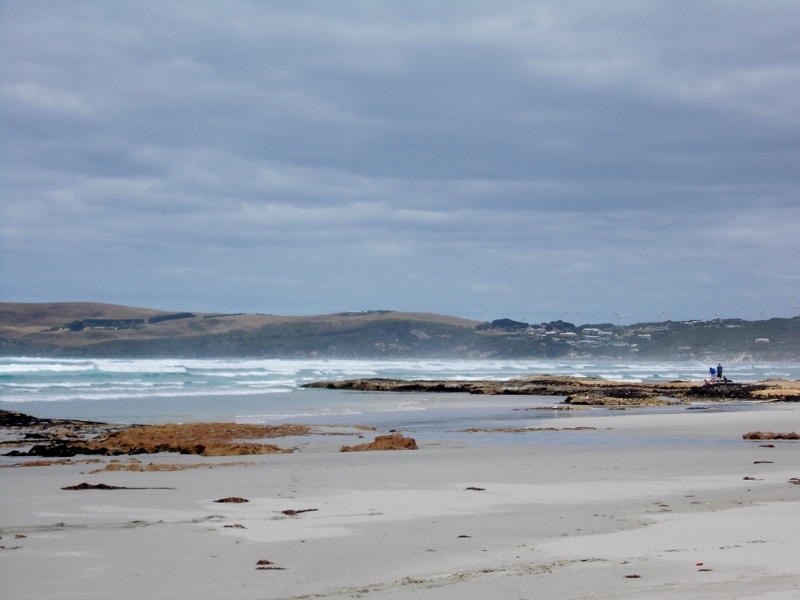 The Davey family left Port Fairy and made their way to the Port Campbell/Princetown district. 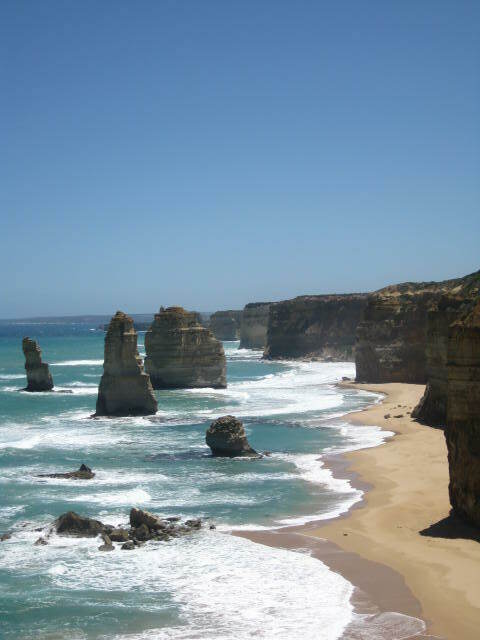 They selected land on the Great Ocean Road, between the Loch Ard Gorge and the current Twelve Apostles Viewing area. 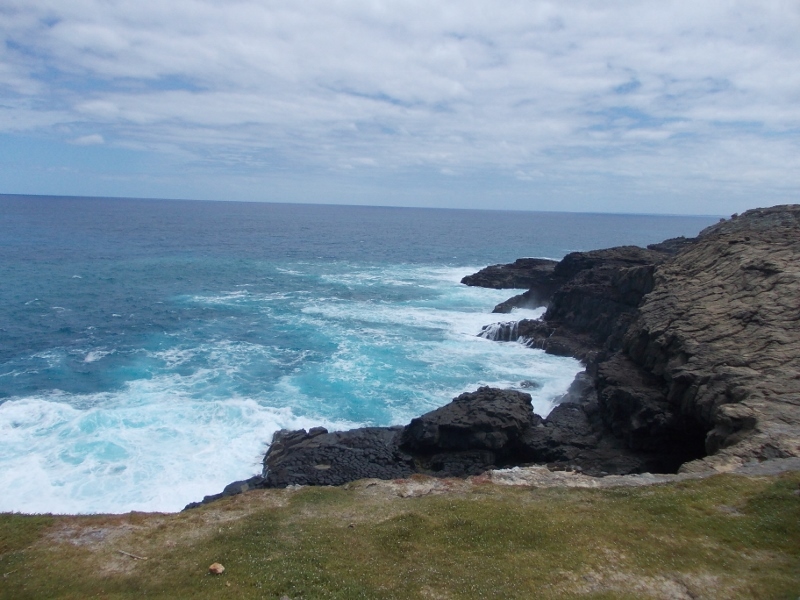 They also had the use of the land down to the cliff tops below. THE TWELVE APOSTLES, PORT CAMPBELL. The Daveys named their property Edgecombe. Their neighbour to the west was Hugh Gibson of Glenample, co-owned by Peter MacArthur of Merringoort. It was at Glenample in 1878 Tom Pearson arrived to raise the alarm of the wreck of the Loch Ard. Fellow survivor Eva Carmichael stayed at Glenample for several weeks while recovering. Robert Davey was a trustee of the Loch Ard Gorge Cemetery, the burial place of the victims of the wreck. It was an isolated area but from around the end of the 1800s, the mail-coach passed via Edgecombe as it travelled between Princetown and Port Campbell and continued to do so for around twenty years. 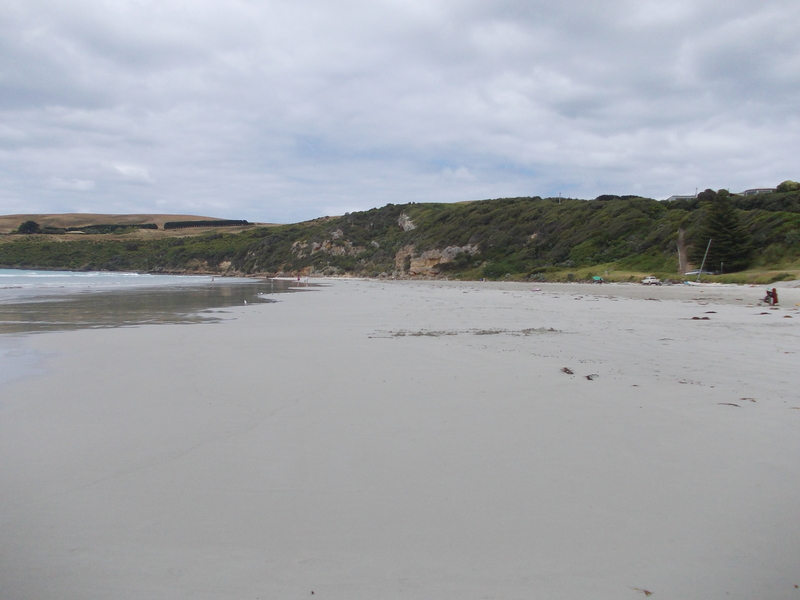 Each of the Davey’s acquired more land in the Port Campbell/Princetown district. In 1888, Edith applied for a grant to buy land in the Princetown township and was successful and in 1889, she applied to lease 720 acres. It was tough times though with a drought and impending depression. By 1892, the rent for Edith’s lease was in arrears. 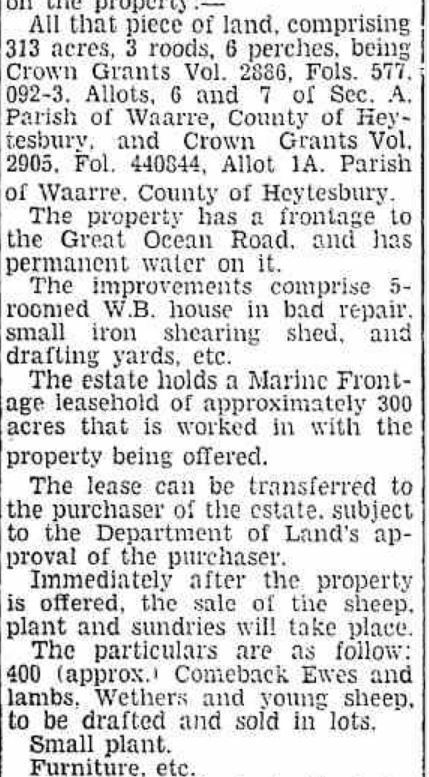 Her worries continued through the decade and in 1897, the local Land Board ruled she must pay five rent instalments at once and the balance in three months. The Davey’s attended St Luke’s Church of England at Princetown where Edith was the organist. She played the piano and sang at many concerts in the district over the years. Sometimes she sang duets with her sister Annie. In 1896, at a concert at the Presbyterian Church in Princetown, Edith played a piano duet with a local boy and she later sang “The Holy City” in “her usual pleasing manner”. During May 1904, Edith was presented with a gold and pearl brooch set and a book “Sanctuary Series of Voluntaries” for her many years of service as the organist of St Luke’s Church, Princetown. Like her sister Edith, Annie Davey never married and like Edith acquired several properties. When she reached her fifties, Annie began experiencing some ill-health and in 1910, the once active woman was described as “despondent”. Annie planned a holiday but on the day she was due to leave in August 1910, her body was found in a waterhole at the back of the property. She was forty-seven at the time. Annie died intestate and that prompted her father Robert to write a will, leaving everything to Edith. Robert Davey died the following year at the age of ninety. Edith and her mother Ann continued on at Edgecombe. By the time of her father’s death, she was fifty-five. In 1912, wild dogs were killing Edith’s lambs. In order to protect her flock, she was staying out overnight. In 1915, her mother Ann died aged eighty. Edith remained alone at Edgecombe for the next twenty-four years, her five-roomed cottage falling into disrepair. She died at the Cobden Hospital in 1939 aged seventy-six. Edith’s obituary in the Camperdown Chronicle described her as one of the “grand pioneer women of Australia”. “MISS EDITH DAVEY” Camperdown Chronicle (Vic. : 1877 – 1954) 26 September 1939: 5. Web. 6 Mar 2018. 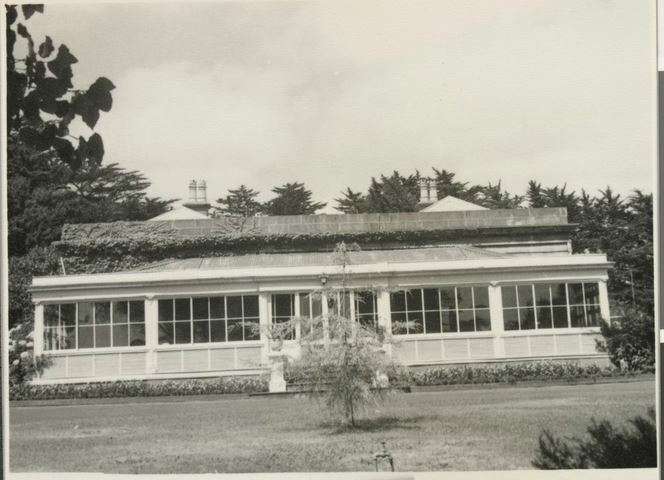 Soon after Edith’s death, Edgecombe was sold as was the stock, plant, and furniture. “Advertising” Camperdown Chronicle (Vic. : 1877 – 1954) 28 November 1939: 6. Web. 7 Mar 2018 <http://nla.gov.au/nla.news-article27400636&gt;. Mary Learmonth was born in 1863 at Hamilton the daughter of Peter Learmonth and Mary Jarvey Pearson of Prestonholme Hamilton. Mary was a sporty young woman, with a talent for tennis and a champion croquet player. She also enjoyed golf but doesn’t seem to have played competitively until she was in her thirties during the 1890s. She married Hamilton doctor David Fraser Laidlaw on 30 November 1899 at Prestonholme at the age of thirty-six. Her brother Allan gave her away and she wore a gown of white satin with lace and chiffon trim. Fifty guests enjoyed the wedding breakfast in a marquee on the property. As Mary and David left for nearby Mountajup to catch the afternoon train, they were showered with rose petals by the guests. Mary and David Learmonth lived at Eildon on the corner of French and Thompson Streets Hamilton, overlooking the Hamilton Botanic Gardens. 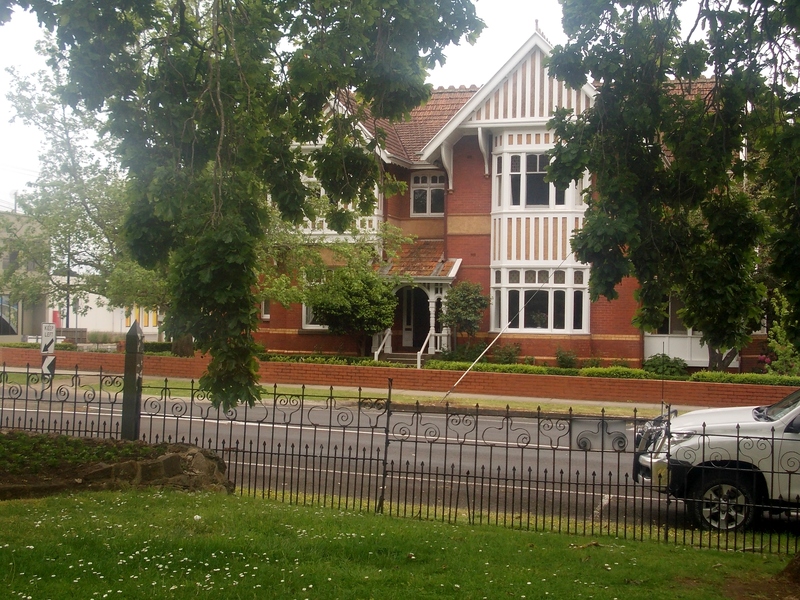 The house was designed by Ussher and Kemp in 1904. 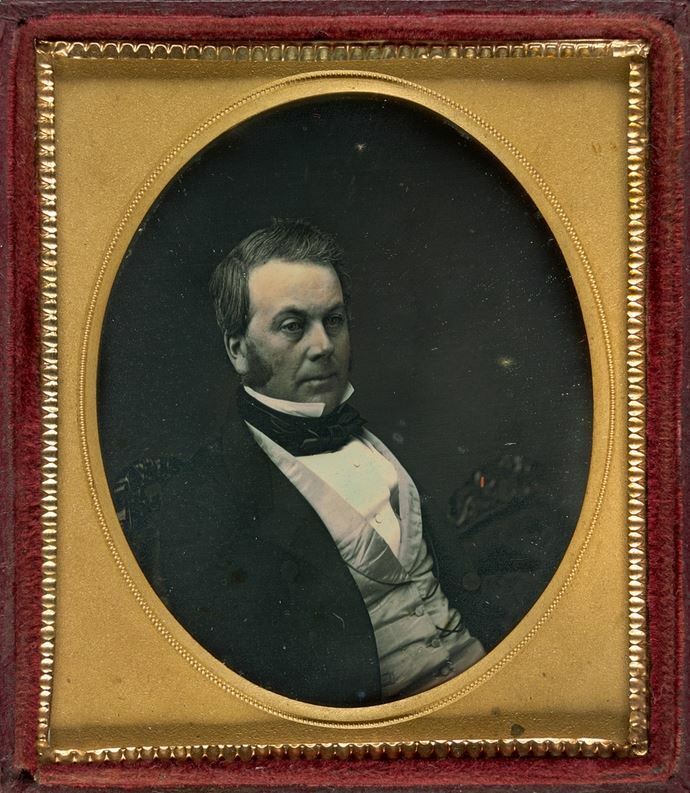 David was the Chief Medical Officer at the Hamilton Hospital but he also had a surgery at Eildon. Mary set about establishing a garden on the property and became one of the finest in the town. Marriage didn’t put an end to Mary’s sporting activities, in fact, her involvement in golf increased and she even had time to act as the inaugural captain of the Hamilton Ladies Miniature Rifle Club formed in 1908. As well as local golf tournaments, Mary played further afield including the 1904 National Championships in 1904 where she won the Bogey Handicap with a score of 88 and hit the second longest drive. She played in the Victorian Championships in September 1909 and won the longest drive at a length of 186 yards (170 metres). In 1930, at the age of sixty-seven, Mary won the Mount Gambier Ladies Championship at the club’s annual tournament. At Hamilton Golf Club, Mary was the undisputed ladies champion for many years winning the ladies’ championship an amazing seventeen times. Her first win was as Miss Learmonth and the rest as Mrs Laidlaw. 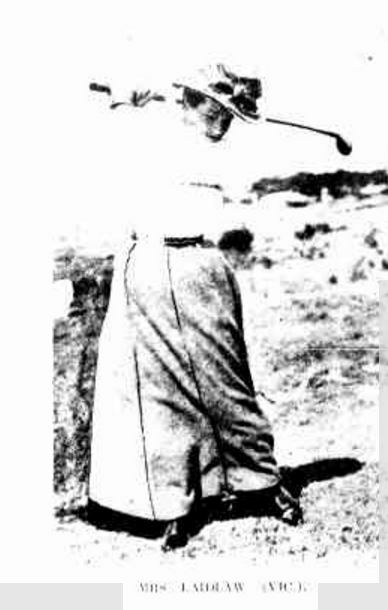 “Ladies’ Australian Golf Championship.” The Sydney Mail and New South Wales Advertiser (NSW : 1871 – 1912) 31 August 1904: 541. Web. 7 Mar 2017 . Other than sport, Mary was president of the Hamilton branch of the Australian Women’s National League (AWNL) and chair of the Wannon Electorate of the AWNL covering an area from Horsham to Portland. She was also a member of the Hamilton Horticulture Society, the Hamilton branch of the Red Cross Society, and the Hamilton Ladies’ Benevolent Society. Mary eventually becoming an officer of the latter organisation. In 1935, after sixty-nine years the decision was reached to finish up the Hamilton Ladies’ Benevolent Society due to decreasing demand for their services. Mary and fellow officer Mary Ann Strachan presented a petition to the Practice Court, requesting the surplus funds of the society, totalling £600, be donated to the Hamilton Hospital maternity ward. Their request was granted on 11 June 1935. As if that wasn’t enough, Mary showed Airedale Terriers with success. 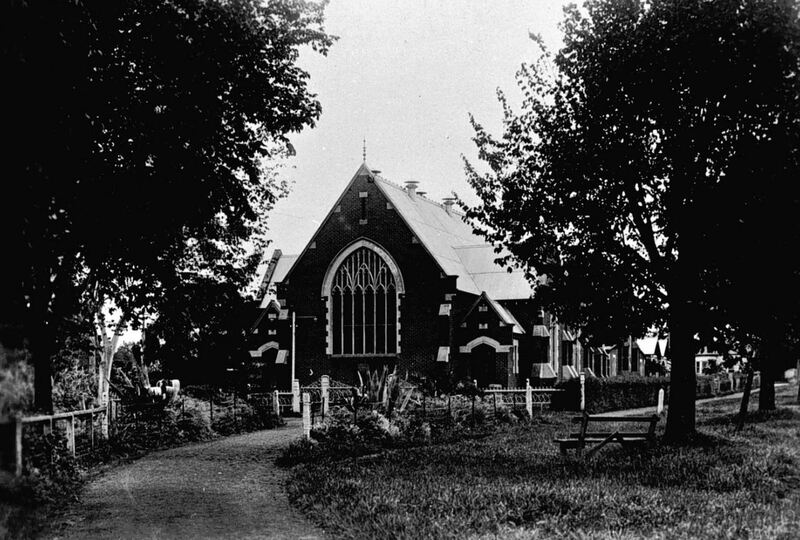 She collected books for the British and Foreign Bible Society and she was a devout member of the Hamilton Methodist Church (below) as were he parents before her. A slight hiccup in Mary’s life came in 1916 when charged with driving a motor car in a dangerous manner. The charges arose from a collision with a horse-drawn wagon. Fortunately, they were dismissed when it was found the accident was not caused by Mary’s speed, but the wagon driver who was turning at the time. In the same year, Mary decorated her car and drove it in a procession through Hamilton. David Laidlaw died in October 1925 aged fifty-six. Mary’s widowed brother Stanley Learmonth moved in with her at Eildon. Mary died at Eildon on 2 April 1939 at the age of seventy-one. 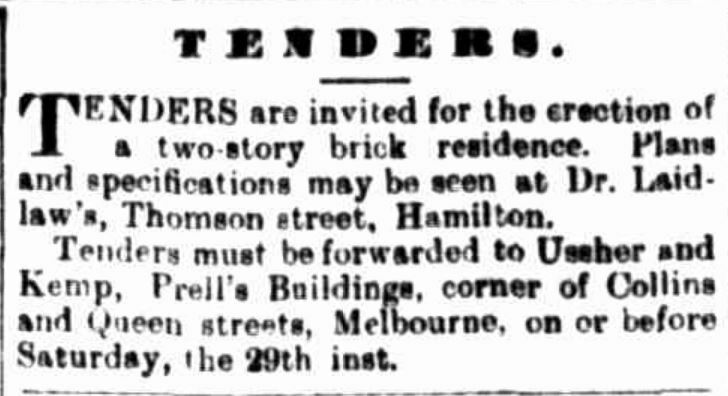 Eildon was sold after her death to the Napier Club, the female equivalent of the Hamilton Club. The club, formed around 1931, still occupies Eildon today. It’s time to rejoin The Vagabond on his tour of Picturesque Victoria. Last time we caught up with him, he was touring the town of Portland. In this instalment, he ventures out to the countryside surrounding the town and he was not disappointed. 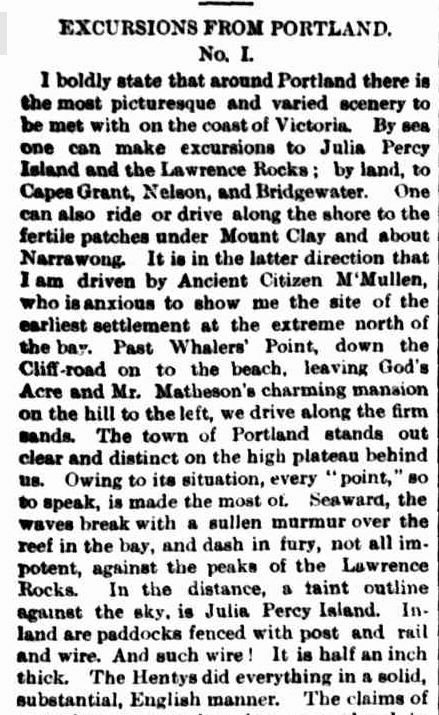 I would have to agree with him that the landscape around the town “is the most picturesque and varied scenery” seen along the Victorian coastline. With an old Portland citizen, the Vagabond headed toward Narrawong and Heywood. 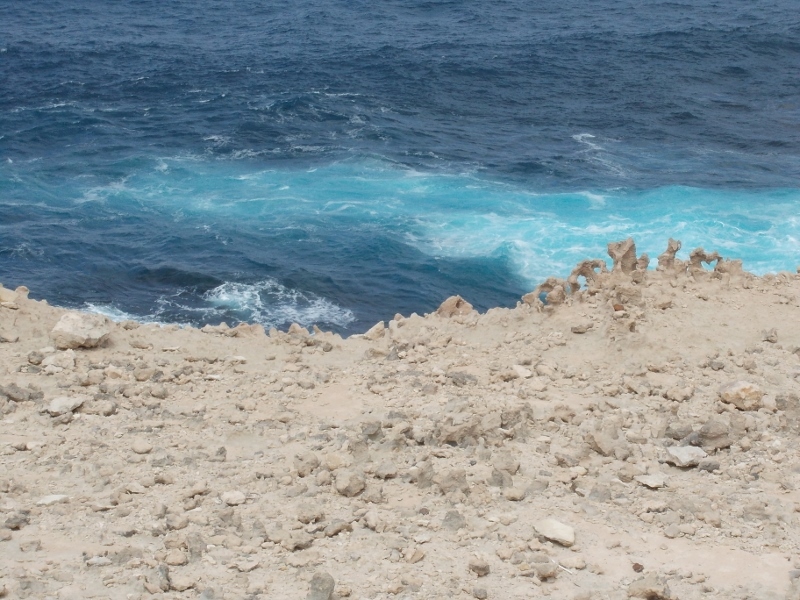 Looking out to sea he caught a view of Julia Percy Island and Lawrence Rocks. The Vagabond reflected on the early settlement of the district and likened the countryside around him to an English country lane. Out of Portland , the Vagabond and the “Ancient Citizen” met the colony’s first road, built by the Hentys. Although the colony was only within the first 50 years of settlement, change was upon it. The railways had been costly to the hotels along the roadways as noted by The Vagabond as he passed two empty hotels. After a stop in Portland, The Vagabond set off again for the rugged coastline of Nelson Bay. 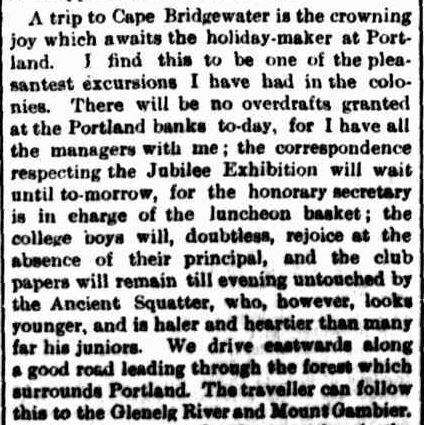 The secretary of the Portland Jubilee committee accompanied him, one of many gentleman offering endless hospitality to the acclaimed writer, hopeful for a good word about their town. 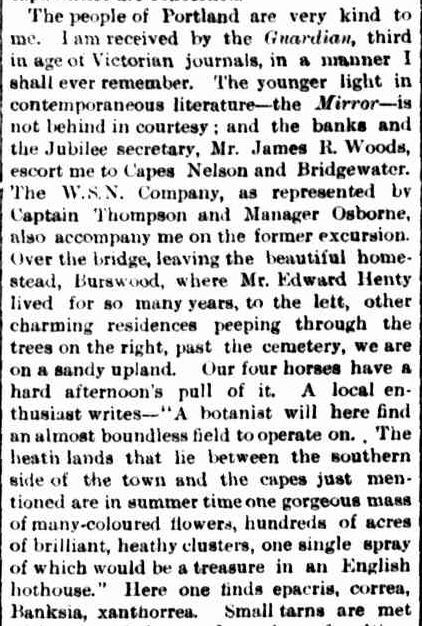 As they left Portland, heading West, the travelling party passed “Burswood” the former home of Edward Henty and they admired the unique flora along the roadside. 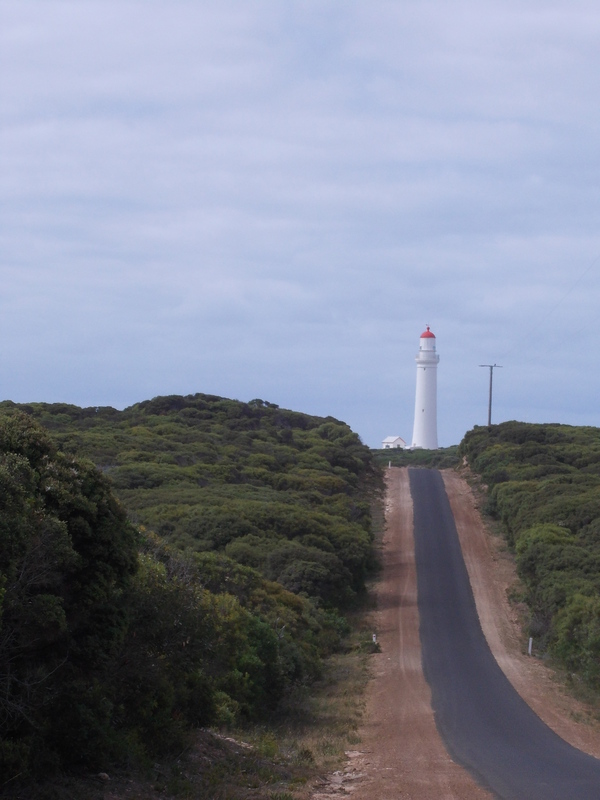 Ahead The Vagabond could see his destination, the Cape Nelson lighthouse. 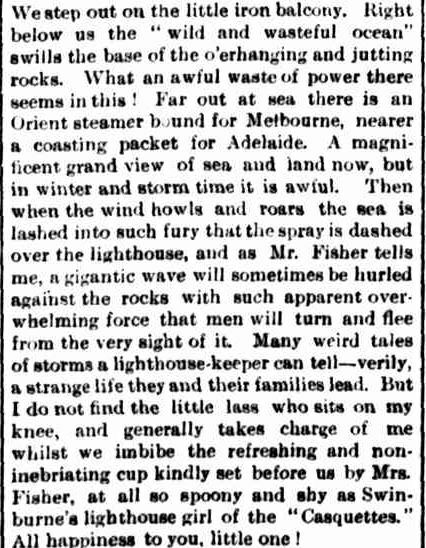 After climbing the 115 steps to the balcony near the top of the lighthouse, The Vagabond looked out to sea at the passing vessels, while the lighthouse keeper, Mr Fisher,told him lighthouse tales. 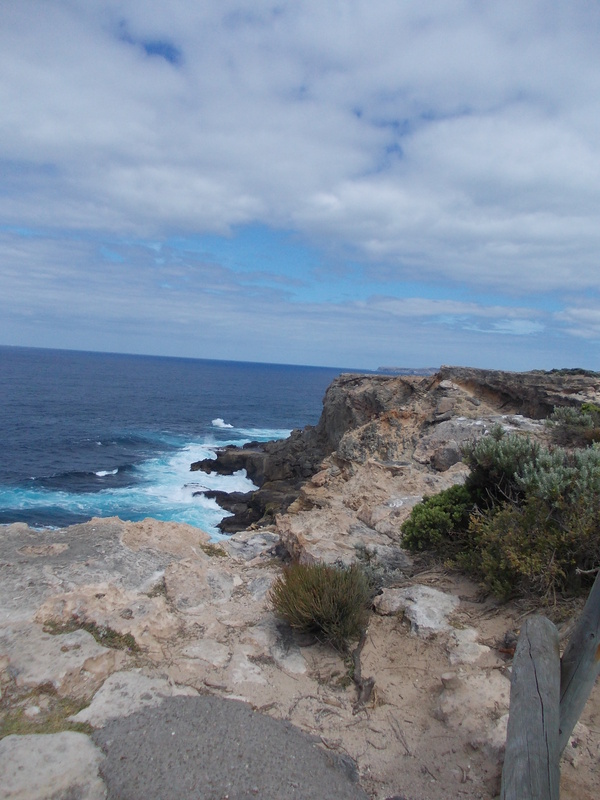 From the lighthouse, the horse’s heads turned toward Cape Bridgewater. The Vagabond quipped that the Banks of Portland would not be offering customers overdrafts on that day because all the managers were travelling with him. 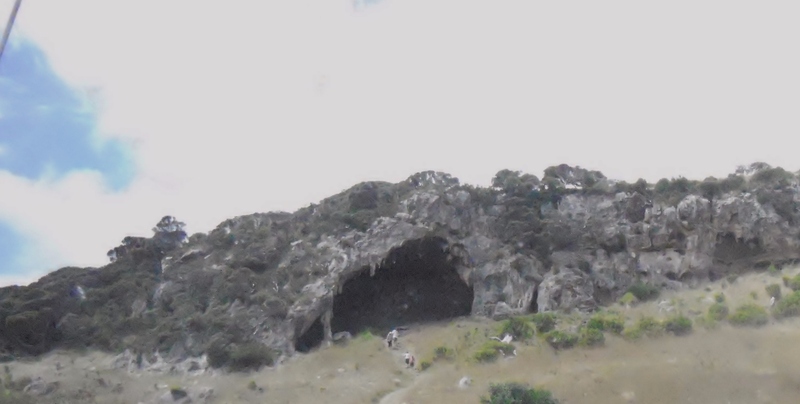 The Vagabond stopped to marvel at the Bat’s Ridge cave. 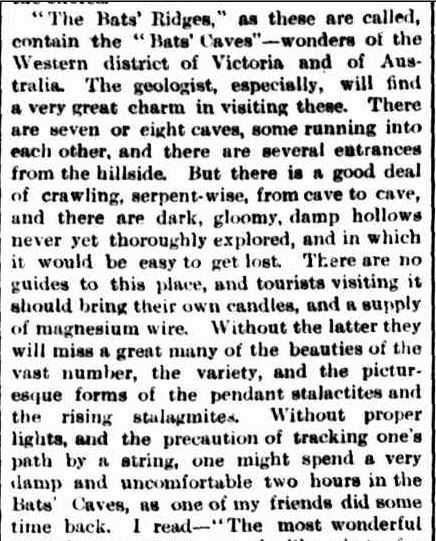 He advised visitors to the caves to take their own candles, magnesium wire and string. A little further on and the group arrived at serene Bridgewater Bay and its small settlement. 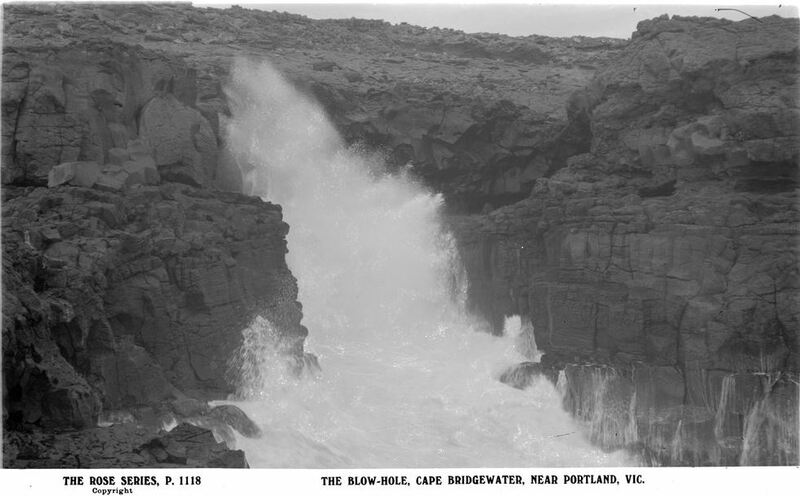 Continuing westward they came to Cape Bridgewater and the Blowholes. Join The Vagabond on his next instalment of Picturesque Victoria, continuing along the south-west coastline. What did he see that he described as “fearfully sublime” and “grandly weird”? Find out next time. 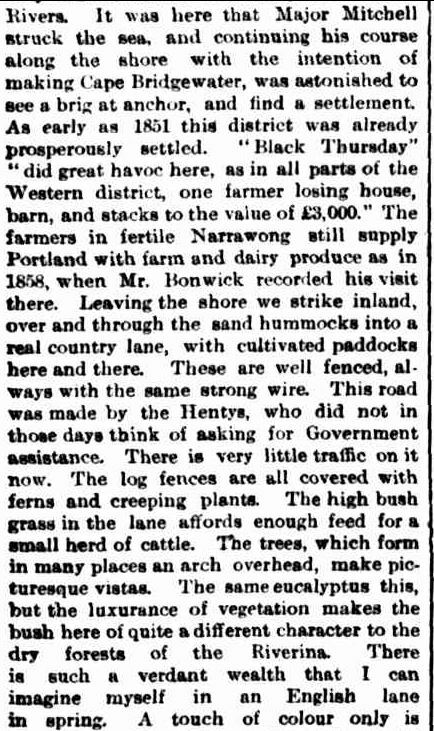 This week’s Trove Tuesday article from the Portland Guardian and Normanby General Advertiser is not an enjoyable read, but it is a reminder of the changes in attitude towards our environment and the creatures that inhabit it. 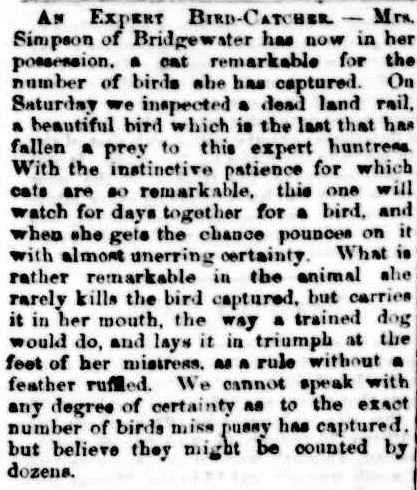 In 1867, a bird hunting cat was a thing to celebrate but remember this was a time when sparrow matches and other bird shooting was popular, so please think no less of Mrs Simpson of Bridgewater. The poor bird involved was a “land rail bird”, most likely the endangered Lewin’s Rail, a small native water bird found in the south-west of Victoria. 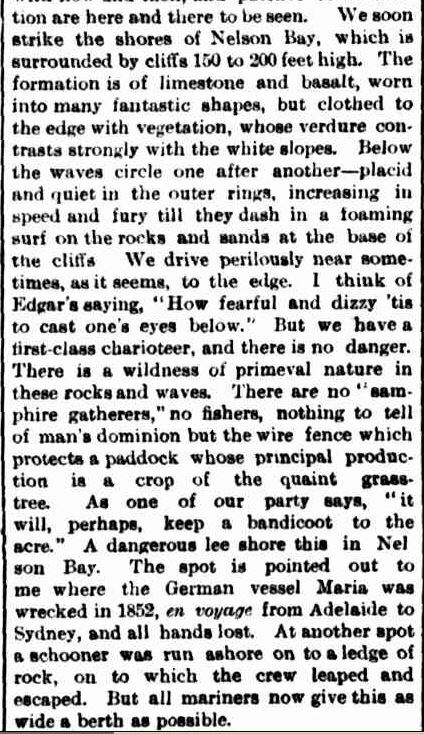 I thought I would share this snippet from the “Portland Guardian” of February 24, 1904. 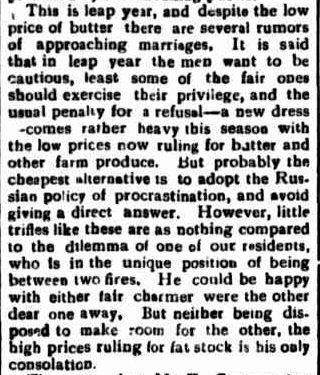 The single men of Bridgewater had a lot to think about while milking the cows during the leap year of 1904. Seventeen more obituaries of Western District pioneers join the collection this month, and what a group they are. I must say I had to pass a lot over, but it will ensure Passing with the Pioneers will be going to at least January 2014! New papers at Trove has guaranteed that. Obituaries came from the Portland Guardian, Horsham Times and Ballarat Courier. There are a couple of special ones, those of James HENTY and Rebecca KITTSON and I highly recommend that you read the obituary in full. I actually found Rebecca’s obituary rather moving and after driving through the Bridgewater area recently, I have great respect for her family and others that settled there. To read the full obituary, just click on the pioneer’s name and the obituary will open in a new tab. Some are a little hard to read, but magnifying the page helps. I have also included a “young” pioneer who has a family link to me. Thank you to Rachael Boatwright for allowing me to include a photo of her family member. James HENTY: – Died 12 January 1882 at Richmond. I thought trashy magazines today told all, but the obituary of the Honourable James HENTY M.L.C. shared every detail of the last twenty-four hours or so his life. How can I possibly give a summary of the life of James HENTY, one of the famous pioneering HENTY clan? Instead, read the obituary, it is great! Sadly I think James’ life may have ended prematurely, if that is possible at eighty-two, due to a collision with a Newfoundland dog the week before. Hugh MCDONALD: Died 30 January 1899 at Portland. This is a timely obituary coming so soon after my Portland trip. While there, I learnt something of the wreck of the steamer Admella in 1859 and the Portland life boat crew that went to her aid. Hugh McDONALD was one of the brave men on board the life boat during that daring rescue. William GARDINER: Died 17 January 1904 at Warracknabeal. William GARDINER, another pioneer with an interesting life. He arrived in Victoria in 1849 aboard the barque Saxon and spent time in Melbourne, Geelong and the goldfields, before heading to New Zealand. On his return to Australia, he lived in Port Fairy and Hamilton, working as a journalist, before moving to the Wimmera as a correspondent for the Belfast Gazette. He like it so much, he decided to select land at Warracknabeal. He also worked as a correspondent for the Horsham Times and built houses! Jean McCLINTOCK: Died 19 January 1904 at Melbourne. While only forty at the time of her death and not an “old pioneer”, I have included Jean as she was the sister-in-law of Alfred Winslow HARMAN. Jean married William MILLER and they resided at Rupanyup. After some illness, Jean travelled to Melbourne for an operation, but she died as a result. Jean McClintock & William Eaton Miller. Photo courtesy of Rachael Boatwright & family. Joseph JELBART: Died 17 January 1904 at Carapook. Joseph worked as the mail contractor between Carapook and Casterton up until his death. Prior to that, he had worked as a blacksmith and a wheelwright at Chetwynd, Merino and Natimuk. Interesting coincidence, just as Joseph did, his father and brother both died on a Sunday morning in the same house. Rachel Forward READ: Died 15 January 1904 at Lower Cape Bridgewater. Rachel Forward READ and her husband Richard Charlton HEDDITCH arrived in Adelaide in 1838 and settled at Cape Bridgewater from 1845 after a stint teaching at the Portland Church of England school. They resided at the Lal Lal Homestead. 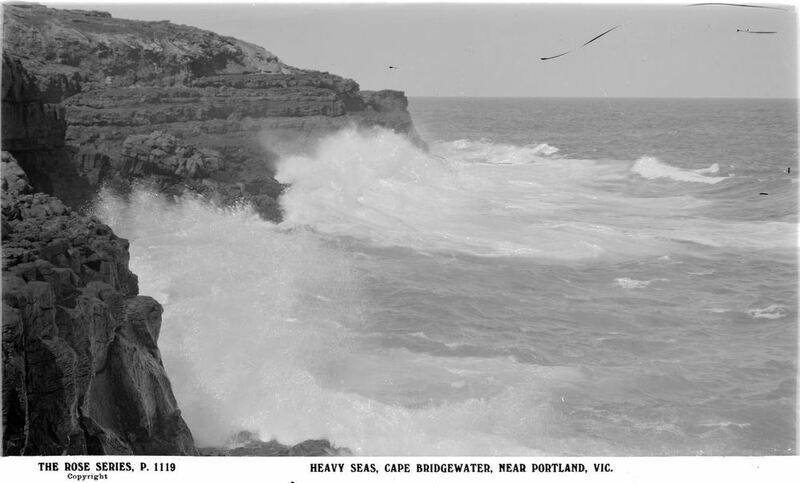 The Victorian Heritage Database listing for Lal Lal includes a letter home by Rachel after their arrival at Cape Bridgewater. 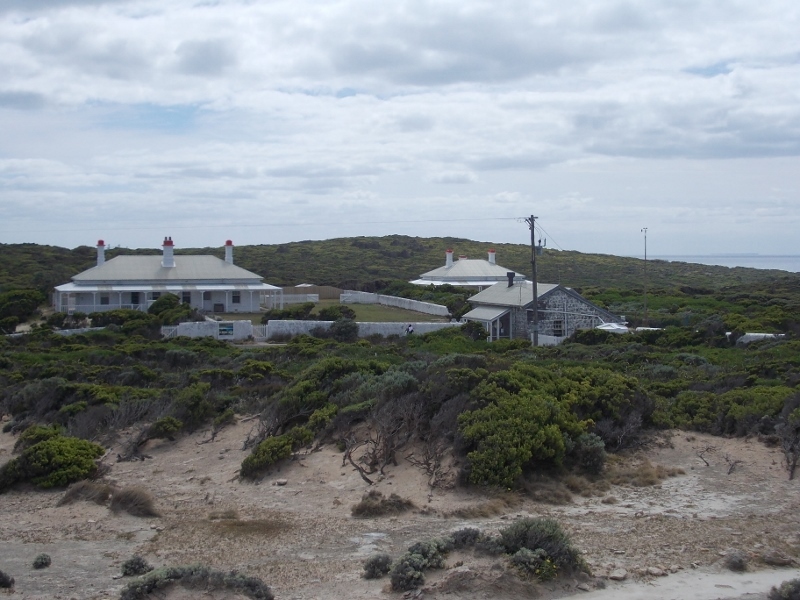 Rachel was buried at the Cape Bridgewater cemetery rather than the Hedditch family cemetery at Lal Lal. Donald McRAE: Died 12 January 1914 at Tooan. Donald McRAE was born in Inverness, Scotland in 1842 and travelled with his parents to Portland. In 1865, he moved to Muntham near Hamilton to farm with brother. The pair eventually selected 320 acres of land each at Natimuk. Donald was a member of the Horsham Caledonian Society. Samuel WALKER: Died 24 January 1914 at Ballarat. Samuel WALKER was born in Cheshire, England around 1828 and travelled to Australia in 1852. After his arrival on the goldfields of Ballarat, he set up a soda water factory which proved profitable for him. He then became a partner in Evans and Walkers and worked as an accountant. He was also the registrar of Births, Deaths and Marriages at Ballarat from 1872. Selina MILLER: Died January 1917 at Wickliffe. Selina MILLER had resided at Wickliffe for almost sixty years. She was twice married. Her first husband was Mr HAIG and her second, George HARRIOTT. Elizabeth HUBBARD: Died 3 January 1919 at Horsham. Elizabeth HUBBARD was born in Norwich, England around 1831 and travelled to Australia with her husband, Mathias HARDINGHAM in the mid-1850s. From Geelong, they travelled to the Horsham area and were two of the first pioneers in that district. Mathias ran the Horsham Hotel for some time. Christina FOX: Died 8 January 1921 at Vectis. Christine FOX was born in Yorkshire, England around 1835. As a teenager, she travelled to South Australia with her parents. She married Robert SANDERS who had also travelled with his parents on the same immigrant ship. John W. DAVIS: Died 24 January 1928 at Horsham. John or “Jack” as he was known, arrived in Australia as a three old, living in Williamstown and then Stawell. He played with the Temperance Union Band in Stawell and then moved to Horsham in 1877 to play with one of two brass bands in the town. Known throughout the northwest for his ability as an euphonium player, Jack was also a bandmaster at Natimuk and Noradjuha. Rebecca KITTSON: Died 4 January 1929 at Portland. What a grand old pioneer Rebecca KITTSON was. A colonist of eighty-eight years, she was a month from her 102nd birthday. 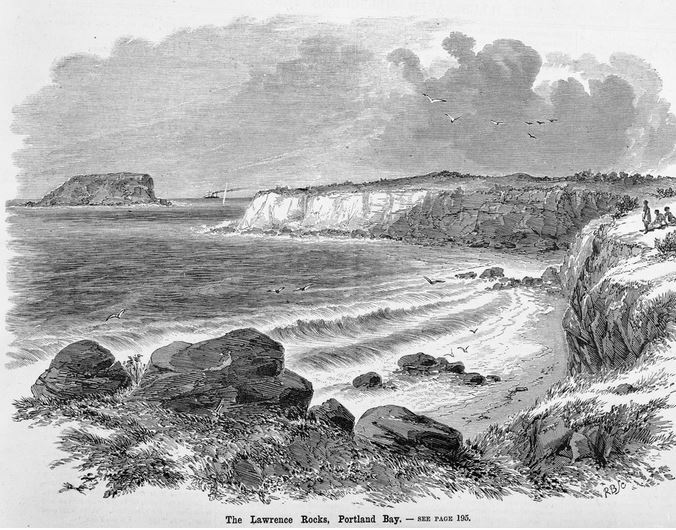 Arriving in Melbourne from Ireland aged eleven, she spent the next year in Melbourne, before joining her family at Cape Bridgewater where her father James Kittson had settled. She married Reverend William LIGHTBODY, a Wesleyan minister in 1852. This obituary is a must read. 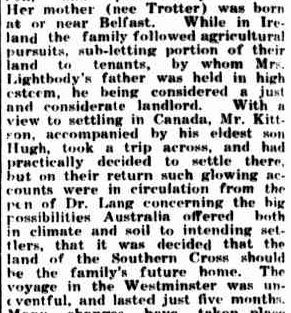 Mrs LIGHTBODY, as she was known for most of her life, was the last surviving member of her family and the obituary gives a glimpse at how the KITTSON’S came to be in Australia. Adrian ANDERSON: Died 16 January 1932 at Horsham. This is a first for Passing of the Pioneers. Adrian ANDERSON was an immigrant from the United States. Wisconsin to be precise. He arrived aged four, with his parents and resided in Western Australia until he was ten. The family moved to Victoria, where he remained. He ran a shop in Jeparit before his death in the Horsham Base Hospital. Agnes Sarah COOK: Died 18 January 1942 at Casterton. This obituary begins “Born in a small house on the banks of the Glenelg River at Casterton seventy-nine years ago…”. Agnes was a lady that like the past and the future, knowledgeable about the history of Casterton, she also liked to predict the future. Agnes married Robert SYLVESTER and they had four children. Helen GULL: Died 18 January 1942 at Casterton. Helen was born on the ship Helen during her parents’ voyage to Australia in 1852. The GULL family became respected pioneers throughout the Western District. 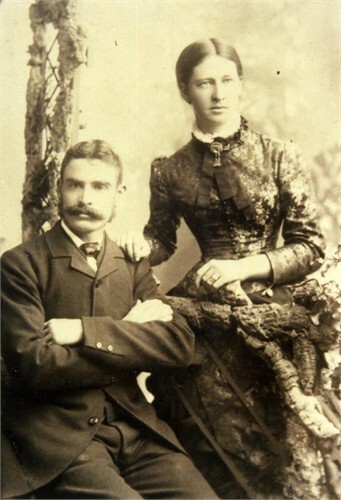 Helen married Frederick PERRY in 1876 and they resided at well known Western District properties, Rifle Downs at Digby and Runnymeade at Sandford. Frederick later ran the Digby Hotel. It was great to get reacquainted with Portland. 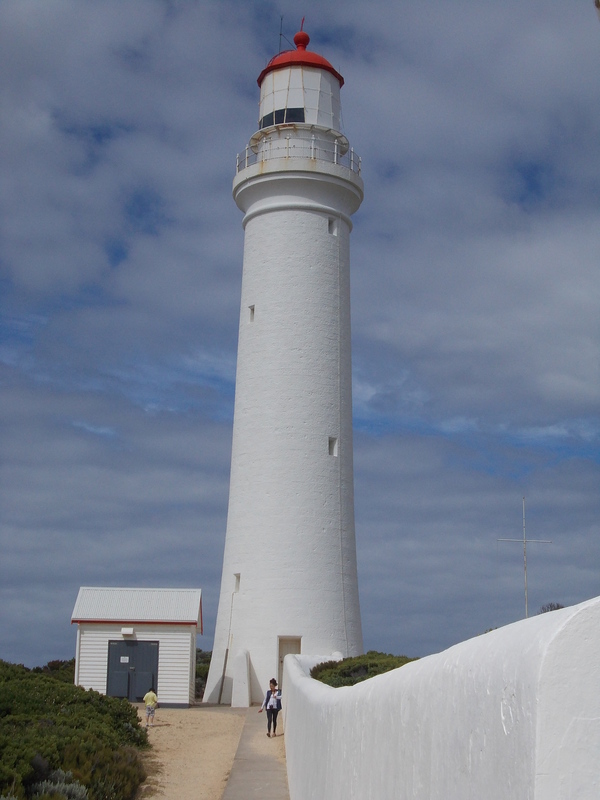 Apart from a quick overnight trip about 15 years ago, I had not visited since the 1970s and 80s with most of my time then spent around the harbour and foreshore. The town really has not changed, but now, compared to when I was a pre-teen on Sunday afternoon outings, I have greater appreciation of Portland’s history. It did turn out that some of those Sunday afternoon outings were to witness events which are now engrained in the history of Portland. At one time, around 1979, we drove from Hamilton to Portland just to see a live sheep export ship! Sounds boring, and it probably was for an 11 year old, but a storm was brewing . The following months, into 1980 saw protests, black banned transport companies and disgruntled meat process workers from the local Borthwicks abattoir. 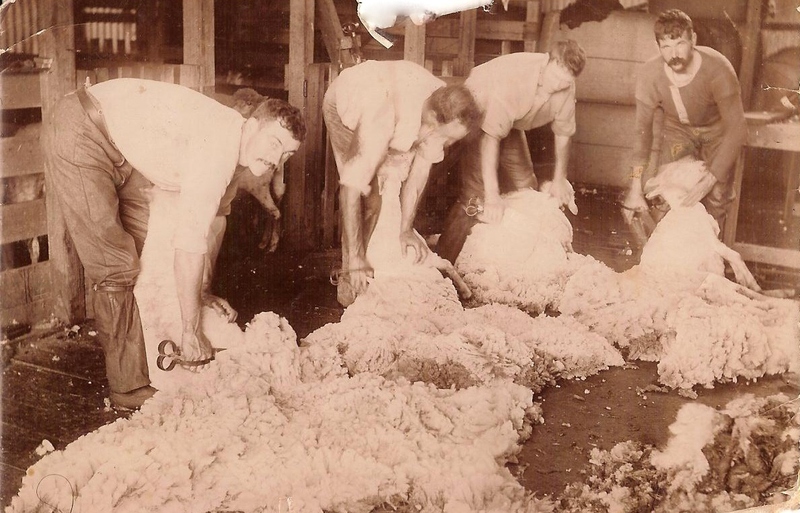 The issue was the talk of the Western District and beyond, at a time when the Western District “rode on the sheep’s back”. Another visit was to see the ongoing construction of the Alcoa plant, now a familiar fixture on Portland’s landscape. Construction began in 1981 and smelting began in 1986. The arrival of Alcoa was a milestone in Portland’s history, offering employment and growth. Over a series of posts I will share some of what we saw on our recent visit, including the early architecture of Portland, the Cape Nelson Lighthouse, Bridgewater and the Old Portland cemetery. It will be a busy month. As well as school holidays and extra “real” work for me, there will be a January Passing of the Pioneers and I will be joining my fellow geneabloggers for the Australia Day 2012 blog: Wealth for Toil . I also will be posting my family’s stories, which is really why I’m here. I just get a bit sidetracked. I will share the stories of Sarah and Walter Harman, two more of the children of Joseph and Sarah Harman. I am already looking forward to February when school returns, so I can have a rest! 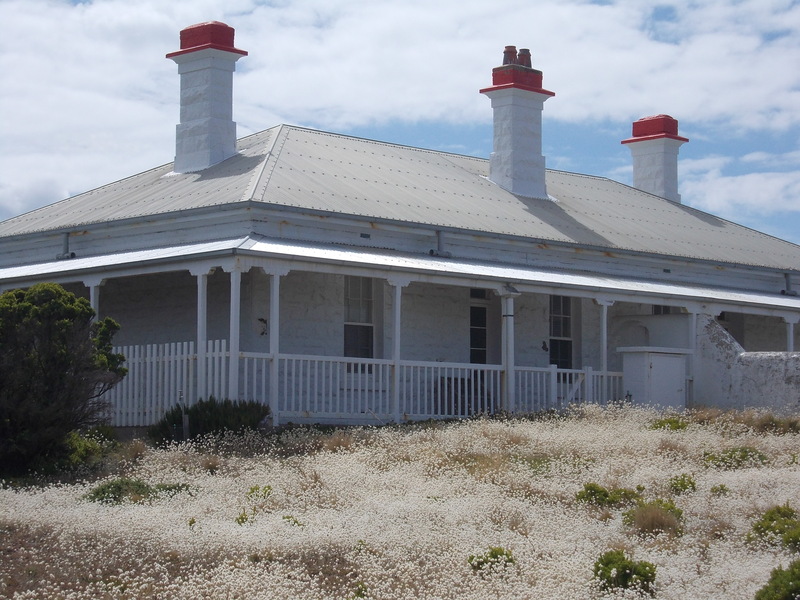 Just to give you a taste of what is to come, this a photo I took of the Cape Nelson Lighthouse Keeper’s cottage. The Portland Guardian of May 26, 1927 reports the death of Mrs Hugh Kittson. The obituary gives much information about Mrs Kittson’s early life including her arrival in Australia and her marriage. She was 94 years old and had been in Victoria for 82 years and had many memories of those early times. As I read her story, I wanted to know more about Mrs Hugh Kittson. The obituary, as was often the way, did not mention her first or maiden names. It did say she had travelled to Victoria on the “Intrinsic” with her parents and two brothers in 1840. After searching death records and Trove, I found that Mrs Kittson was Margaret Jennings, daughter of Cook Abraham Jennings and Hannah Birchall. She was born in Manchester about 1833. Her brothers were Samuel and Robert Jennings and the “Intrinsic” had in fact arrived in 1841. 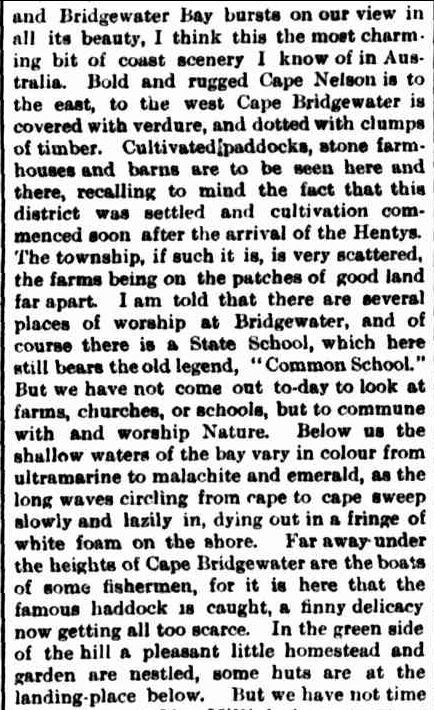 I then discovered stories about two pioneering families of the south Western District I had not heard of before, the Jennings and the Kittsons who were both in the Portland and Bridgewater areas before 1850. 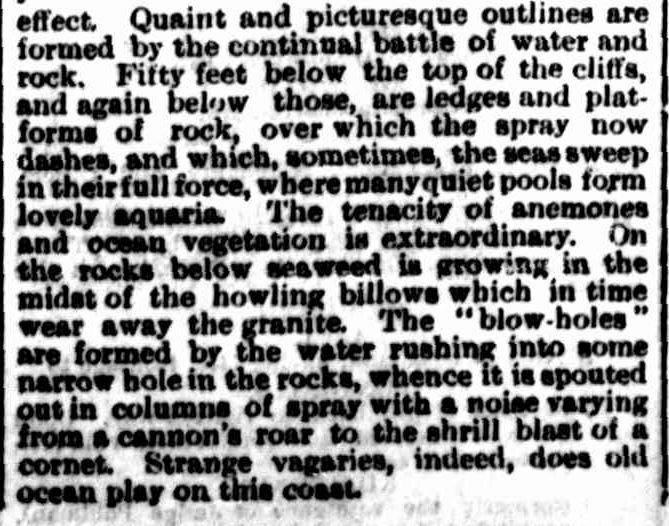 I particular enjoyed a Letter to the Editor from the Portland Guardian of January 23, 1877 by Cook Jennings which painted a picture of the 1840s. Cook Abraham Jennings’ letter gives an insight into life in the early days of Western Victoria. He refutes a claim by Thomas Fairburn to be the first person to find freestone at Mount Abrupt near Dunkeld suggesting it was he instead who made the first discovery. He describes a journey from Portland to Mt Sturgeon and Mt Abrupt almost 30 years earlier. 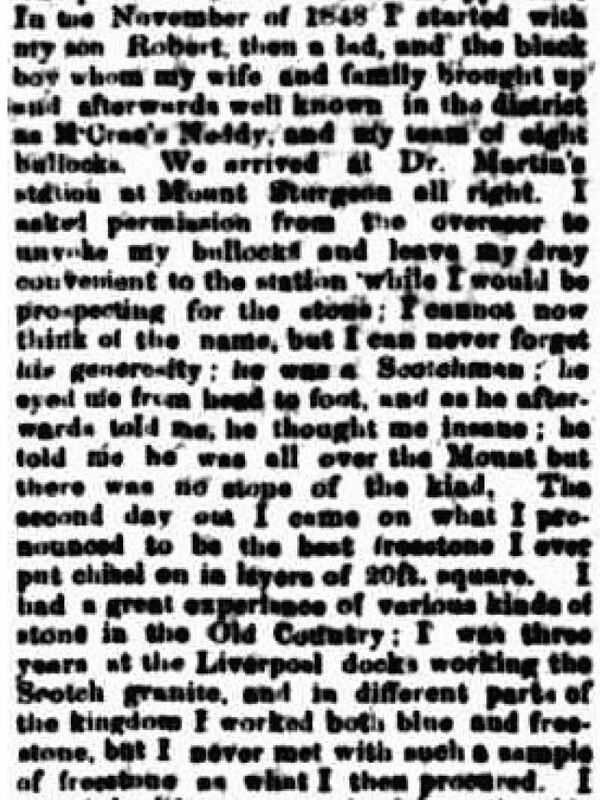 As a stonemason in Portland, he was keen to source some freestone and after a tip-off, headed to the southern end of the Grampians in 1848, his travelling companions son Robert and an indigenous boy raised by Jennings wife. Jennings describes the return journey when “there was no Hamilton…save Mr Beath’s store and Phastock’s public house”. After difficulty crossing the Grange and Violet Creek he eventually reached Portland and sold off the stone, which was still being used as grindstones 30 years later. The letter also shows that overseas travel was not out of the question for those early pioneers. Cook Jennings travelled to Richmond, Virginia in 1858 to lodge a claim on a relative’s will. Although Cook did come across as somewhat of an opportunist! Margaret Jennings’s husband Hugh Kittson was himself some sort of trailblazer. The Irish-born son of James and Catherine Kittson, was reported as the first white person to ride overland from Portland to Melbourne. Hugh and Margaret had seven children and surnames of their descendents include Johnson, White and Hodgetts.